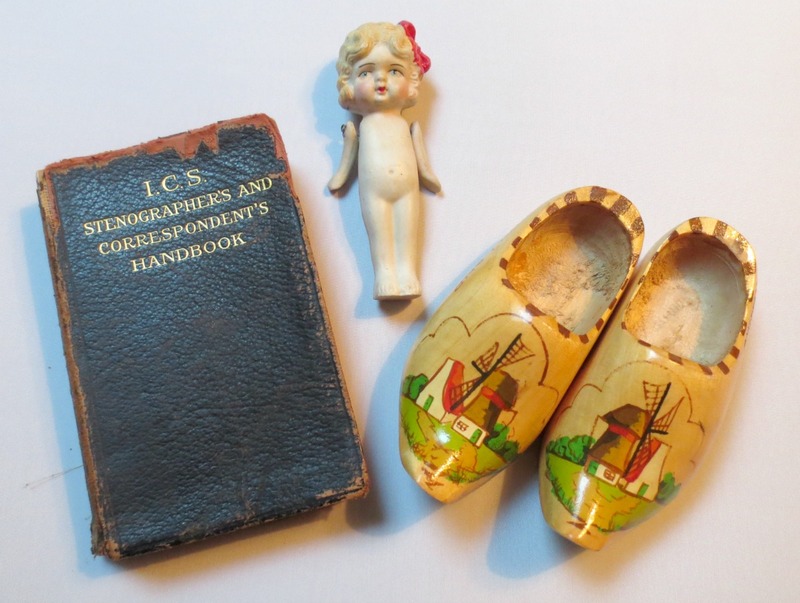 I have a weakness for old things that are charming, unique or lovingly worn. I rarely resist buying them even when I know (or seriously doubt) that I can make much profit reselling them…which is kinda goofy because that’s my business! But I rationalize this behavior by remembering the things I bought for a couple of dollars and sold for over a hundred..my home runs. And I figure not every time up to bat can be a home run. Sometimes just getting to first base is enough! So yesterday at the rummage sale I bought things solely because they captivated me and made me smile. First base things. 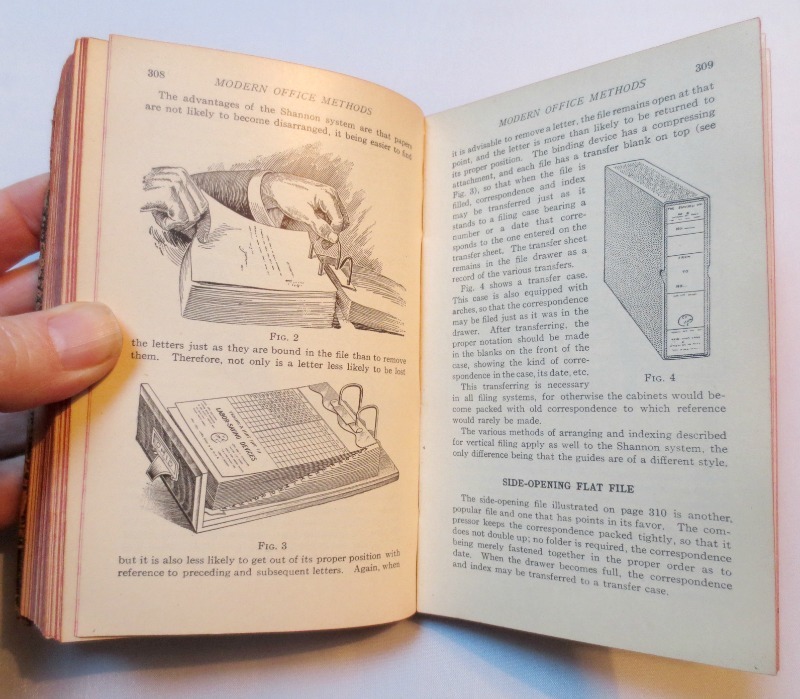 The 1910 stenographer’s book has a section on “Modern Office Methods” that has the best illustrations! 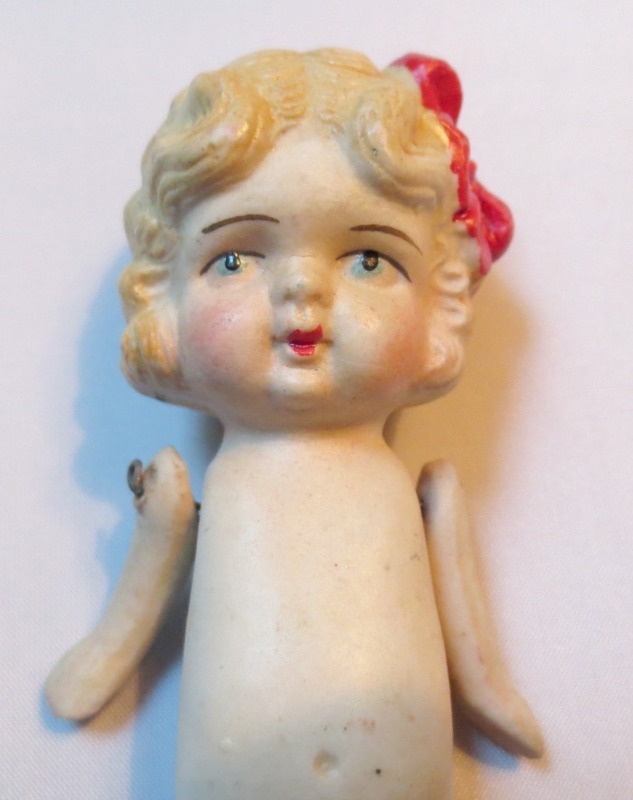 My oldest daughter thinks the tiny bisque Betty Boop doll (made in Japan) is a touch creepy. I am not a doll person, but I don’t think she’s creepy at all, just a touch pensive! 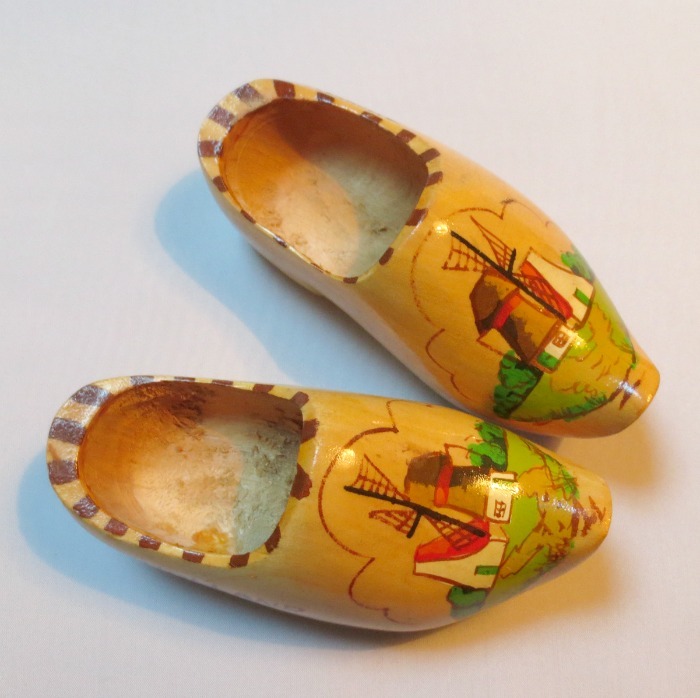 And the wooden tourist clogs from Amsterdam owe part of their charm to their diminutive size…all of 4.5 inches! 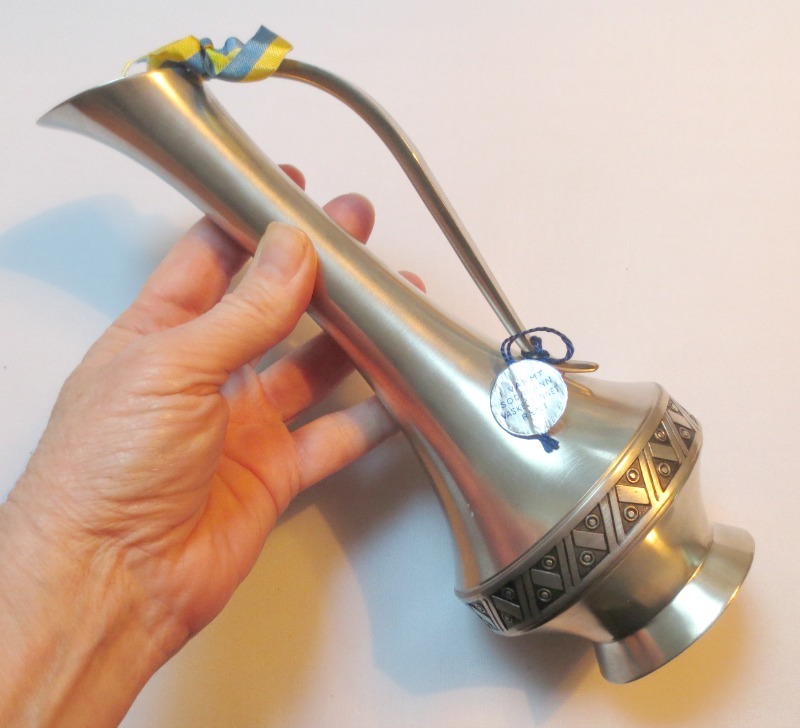 I also bought a handsome pewter ewer that hales from Norway. It has a very cool mid-century vibe and still has its tags. Perhaps my best and most sentimental find though is a falling-apart scrapbook with ’40s/early ’50s greeting cards. It chronicles the birth and first five years of life for Marc. Lots of birthday cards, valentines, Christmas cards…well, you get the picture. Most of the cards are lightly glued in place, some loose, some with little notations below them if a gift was given. I haven’t counted the cards yet, but there’s easily more than 50. 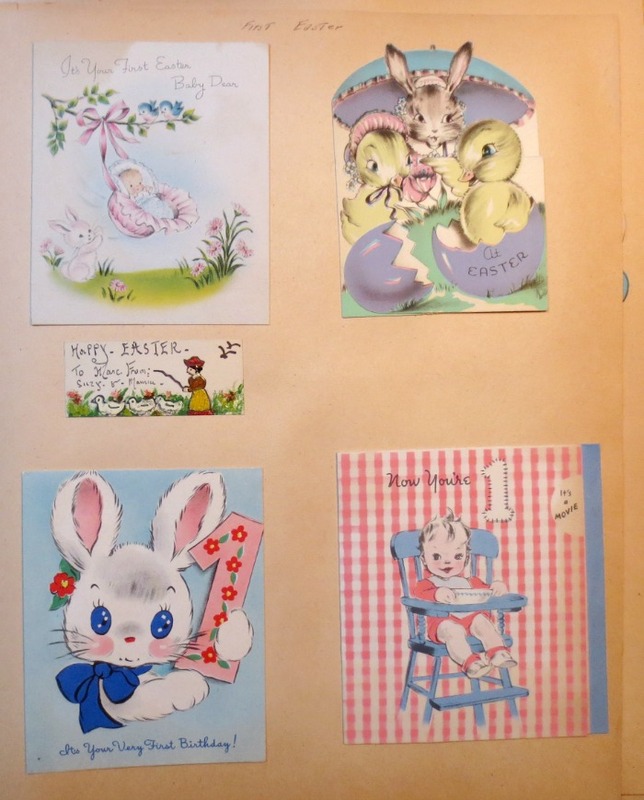 I do know that there is a small market for used vintage greeting cards and am hoping some artist will buy these sweet cards and give them new life in a project. Would love to hear…what can’t you resist buying?? P.S. If you’re starting your holiday shopping, please do consider shopping on Etsy and supporting a small business person. You’ll find so many fabulous things…from handmade soaps, lotions, art, tea, journals, beautiful cutting blocks, jewelry…and of course, lots of vintage items, like in my store. I got a handmade solid wood square coffee table for $5 this weekend. It only needs cleaned up. Made in 1973.